Jean Tinguely is famous for his playful, boldly kinetic machines and explosive performances. Everything had to be different, everything had to move. Precisely twenty-five years after his death, the Stedelijk opens a Tinguely retrospective: the largest-ever exhibition of the artist to be mounted in a Dutch museum. 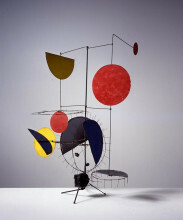 The Swiss artist Jean Tinguely (1925–1991) played a key role in the rise of kinetic art in the fifties. With over a hundred machine sculptures, most of which are in working order, paired with films, photos, drawings, and archive materials, the presentation takes the public on a chronological and thematic journey of Tinguely’s artistic development and ideas, from his love of absurd play to his fascination for destruction and ephemerality. 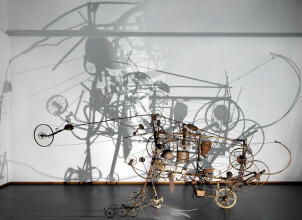 The presentation features his early wire sculptures and reliefs, in which Tinguely imitated and animated the abstract paintings of artists such as Malevich, Miró, and Klee; the interactive drawing machines and wild dancing installations constructed from salvaged metal, waste materials, and discarded clothing; and his streamlined, military-looking black sculptures. Tinguely’s self-destructive performances are a special feature of the Stedelijk presentation. The enormous installations Tinguely created between 1960–1970 (Homage to New York, Étude pour une fin du monde No. 1, Study for an End of the World No. 2, and La Vittoria) were designed to spectacularly disintegrate in a barrage of sound. The presentation also spotlights the exhibitions Tinguely organized at the Stedelijk, Bewogen Beweging (1961) and Dylaby (1962), and the gigantic sculptures he later produced: HON – en katedral (“SHE – a cathedral,” 1966), Crocrodrome (1977) and the extraordinary Le Cyclop (1969–1994), which is still on display outside Paris. The survey ends with a dramatic grand finale, the remarkable, room-filling installation, Mengele-Totentanz (1986), a disturbing display of light and shadow never previously shown in the Netherlands. Tinguely realized the work after witnessing a devastating fire, reclaiming objects from the ashes to piece together his installation: scorched beams, agricultural machinery (made by the Mengele company), and animal skeletons. The final piece is a gigantic memento mori, yet also an invocation of the Nazi concentration camps. Its juddering movements and piercing sounds evoke a haunting, grisly mood. Jean Tinguely created his work as a rejection of the static, conventional art world; he sought to emphasize play and experiment. For Tinguely, art was not about standing in a sterile white space, distantly gazing at a silent painting. He produced kinetic sculptures to set art and art history in motion, in works that animated the boundary between art and life. With his do-it-yourself drawing machines, Tinguely critiqued the role of the artist and the elitist position of art in society. 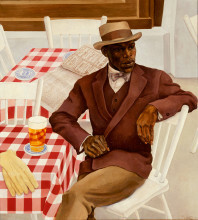 He renounced the unicity of “the artist’s hand” by encouraging visitors to produce work themselves. 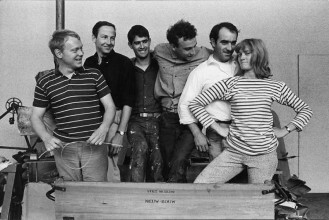 Collaboration was integral to Tinguely’s career. He worked extensively with artists like Daniel Spoerri, Niki de Saint Phalle (also his wife), Yves Klein, and others from the ZERO network, as well as museum directors such as Pontus Hultén, Willem Sandberg, and Paul Wember. 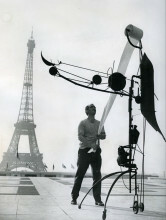 Thanks to his charismatic, vibrant personality and the dazzling success with which he presented his work (and himself) in the public sphere, Tinguely was a vital figure within these networks, acting as leader, inspirator, and connector. Amsterdam has enjoyed a dynamic history with Tinguely. The exhibitions Bewogen Beweging (1961) and Dylaby (1962), for which Tinguely was (co)curator, particularly underline the extraordinarily close relationship that sprang up between the museum and the artist. Not only did he bring his kinetic Méta machines to the Netherlands, he also brought his international, avant-garde network, leaving an enduring impression on museumgoers who flocked to see these experimental exhibitions. Close relationships with Willem Sandberg, then director of the Stedelijk Museum, and curator Ad Petersen prompted various retrospectives and acquisitions for the collection: thirteen sculptures, including his famous drawing machine, Méta-Matic No. 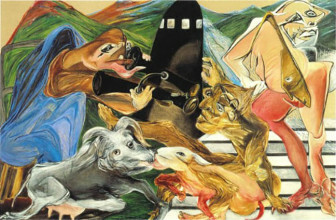 10 (1959), Gismo (1960), and the enormous Méta II (1971). Adults and Museum Card holders must pay a special admission price throughout the duration of the exhibition Jean Tinguely: Machine Spectacle (1 October 2016 – 5 March 2017). We advise you to purchase your ticket online, in advance. If you have an e-ticket, you’ll be able to skip the line for the Ticket Office and go straight to the entrance where your ticket will be scanned. When do the machines move? There are 166 works in the Tinguely exhibition, 62 of which are machine sculptures. 42 of the machines are able to function, which is quite unique. Because Tinguely’s machines look relatively sturdy, they are actually extremely fragile. Most of them have not worked in years. However, the Stedelijk carried out intensive restoration work over the last eighteen months, and now many of the machines are once more in working order. But even so, the machines are still so frail that they cannot run non-stop. If they ran constantly, they would break. This is why they are activated every 5, 10, 15, or 60 minutes. The information label will tell you how often a work moves. Some works have a timer so you can see exactly when the machine sculpture is active. Both Tinguely’s Gismo and the Drawing Machine are particularly fragile. A restorer will activate the kinetic sculptures in the gallery at the following times 11:00, 12:00, 13:00, on the following dates: Monday 10 October, Tuesday 8 November, Tuesday 13 December, Saturday 24 December, Wednesday 18 January and Tuesday 14 February (subject to change). Meeting point for the demos is the book store on the first floor (historical staircase). First the drawing machine (Méta-Matic no.10) will be shown, after that Gismo. Stroll along the highlights and the surprises in our collection and let your eyes and ears get triggered by this audiovisual tour. Available for adults in 4 different languages (NL/ENG/DU/FR). The artist Jean Tinguely thought that an artwork isn’t finished until it moves. So do your part! Step inside Tinguely’s Headquarters and bring his ideas to life. Build an useless machine and get the museum moving. There’s no such thing as standing still! In February 2017 the Stedelijk Museum will host a two-day symposium in the context of the exhibition Jean Tinguely – Machine Spectacle. 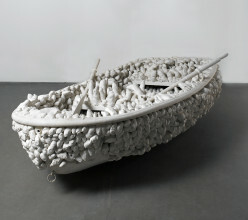 The symposium, entitled Lose Yourself – A Symposium on Labyrinthine Exhibitions as Curatorial Model, starts with and navigates around the territory encountered in the playful exhibitions Dylaby (1962) and HON (1966), in order to investigate the legacy of labyrinthine exhibition models and its relevance in the twenty-first century. This symposium is being organized by the Stedelijk Museum Amsterdam, the Moderna Museet Stockholm, the Tinguely Museum Basel, Vrije Universiteit, Amsterdam, and the Dutch Postgraduate School for Art History (OSK). 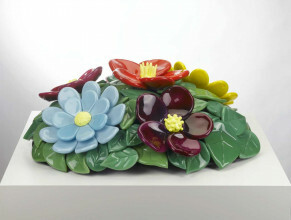 A catalogue will be published to mark the exhibition. Based on years of research conducted by the Stedelijk Museum and Museum Kunstpalast, Düsseldorf, the publication contains essays by several Tinguely experts, among them Margriet Schavemaker, Barbara Til, and Beat Wismer and offers an extensive overview of the work and life of Jean Tinguely (1925–1991), the Swiss artist who was instrumental in the development of kinetic art. While Tinguely’s mechanical metal sculptures may seem witty and playful, their charming absurdity has a dark side: he contrasts play, pleasure and irony with aggression, selfdestruction and a fear of death in an engaging and compelling oeuvre. 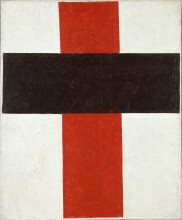 This exhibition is organised by the Stedelijk Museum Amsterdam in collaboration with Museum Kunstpalast, Düsseldorf. 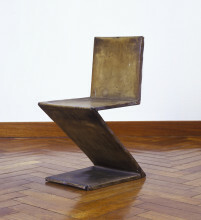 This exhibition is made possible with generous support of the Turing Foundation, All Art Initiatives B.V., the Blockbusterfonds, the LUMA Foundation and additional support by the Swiss Arts Council Pro Helvetia, the Prins Bernhard Cultuurfonds, the Walter A. Bechtler Foundation, Switzerland and Museum Tinguely, Basel.